//Sub/Corpus Blog: Goldies: To keep or not to keep ... ?!? I grew up in a home where pets, lots of them, were the norm, but it’s been ages since I’ve had a pet. Mostly because I've been living in rented spaces for the last several years and most of my landlords tend to frown upon at the idea of having pets in the building. Anyway, I’m back home now, and I thought, I wanted a pet. I wanted to learn and enjoy the responsibility that comes when one gets a pet. Also, I needed some kind of interior decoration piece in my living room to try and make it a bit more homely and inviting. So I made up my mind to start small and get a simple Goldfish bowl. Could be a great starter kit, I thought? Also, the Feng Shui of it didn't sound bad either. the goldfish symbolizes wealth and prosperity in ancient Chinese culture. Am not Chinese, but that can’t hurt, right? One more thing, it is said that having an aquarium in the house helps in the relaxation process, I don’t know, I can’t confirm that! So, I headed out to my local pet store and bought a medium sized Goldfish bowl, two Goldfish and a packet of food pallets. Cost me around MRF 300/-. Not bad, eh? I came back and set them up in my living room right next to my cactus plant. It looks good! Visitors to my place seem to enjoy it, especially kids. Kids love feeding the fish. But here comes the messed up part, some people I know don’t like Goldfish being kept in a bowl. Friend: You shouldn’t keep fish in a bowl. Friend: You should never keep fish a bowl, especially Goldfish. It’s not healthy. Me: They look pretty healthy to me. Friend: No, seriously, you shouldn’t keep Goldfish in a bowl. It’s not healthy, they will not have enough space to swim around and they will not have enough oxygen. Also, the bowl will get dirty pretty quickly and that will harm the fish. Fish in a bowl are never happy. It's animal cruelty! Me: What are you on about? 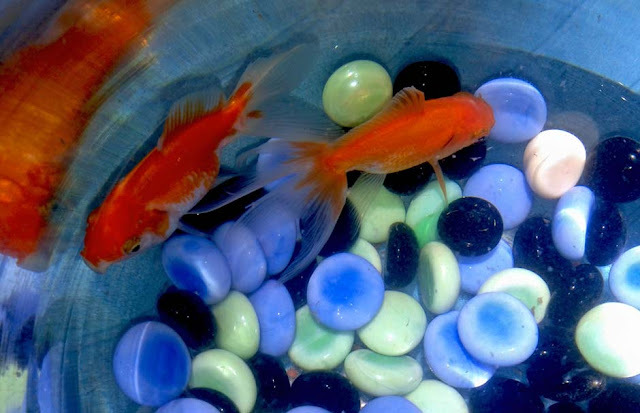 Goldfish bowls are the most popular pets. Every other kid has a Goldfish bowl at home. Also, can you imagine a pet more iconic than a goldfish in a simple glass bowl? If it was animal cruelty, don’t you think PETA would get involved? I’ve never heard of PETA going after Goldfish bowls! I’m not killing a crocodile for leather, nor m I skinning a bear for fur, I just keep a fish in bowl! I don't seem the harm in it. Friend: It’s basically the same thing. It's animal cruelty. Me: Bro, I feed them and clean the bowl regularly. They are well cared for. Friend: Doesn't matter, you should never keep fish in a bowl. Do you have any HD movies I can copy? That was several weeks ago, and I am still keeping the fish. I feed them a pinch of pallets and flakes regularly. I make sure they gobble it up in under a minute so I don't overfeed them. I clean the water every 3 days, and scrub the bowl every other week. The fish look OK, they seem happy. I can understand one's dismay towards irresponsible pet owners, but what I don't understand is advancing a holier-than-thou ideology that large-scale heinous crimes committed against animals is morally equivalent to keeping a pet at home. Thats hypocrisy, and I find it amazing what people are ready to believe after reading a slogan on a brochure from an animal rights organization. What do you think? Should I get advanced aquarium system with a bed filters and oxygen pumps just to keep two Goldfish, or would that be an overkill? you shouldnt keep a Goldfish in a bowl..
i'm surprised u think they're happy in a tiny bowl. u really believe there's no harm in keepin things in such confinement? you may not be treating them cruelly but still they're locked up for your pleasure. Also, assuming you are not vegetarian, how do you think the fish feel, when you hook it out of the water, let it die by suffocation, scale it, flay it, deep fry it and eat it ?? ?